Scrum Team: A cross-functional team of marketers, which could consist of marketing operations, content, and design. Typically, the team should consist of five to nine people. Requestor: Anyone who requests work from the Scrum Team. This can be either an individual person or a group of people. Team Member: Anyone who contributes to the Scrum Team – including the Scrum Master. Daily Stand-Up: A short daily meeting with scrum team to go over priorities for the day. Backlog: An evolving list of work requests, tasks, and subtasks—often expressed in terms of prioritized by the requestor—that tells an Agile team what to work on first. Story: A high level definition of a work request which is assigned a point value based on the hours it will take to complete it. Requests are converted into stories before they move from the backlog to the sprint. Sprint: An iteration or uninterrupted period of time during which an Agile team works together to complete a list of stories from the backlog, usually two to four weeks long. Storyboard: A visual representation of the stories or sprints being worked on. A storyboard can be virtual or physical and shows each story progressing from the backlog, to in-process, to the review stage, and finally its completion. Can you envision your team adopting this new lingo? 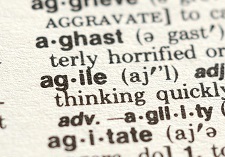 Now that you know how to speak Agile, you’re one step closer to starting up your Agile Marketing machine. To take a deeper dive into Agile concepts and strategies, visit our Agile Development Methodology page.